New Delhi: The Congress is using feedback from its workers and voters to determine whether to enter into an alliance with a particular party or not — say, with the TDP in Telangana — to select candidates for the assembly elections and to identify issues that are troubling voters in their constituencies, among others. The first such experiment — aimed at strengthening what was then viewed as internal democracy in the grand old party — was made by Rahul Gandhi when he became the general secretary in charge of the Indian Youth Congress and the NSUI, the student wing of the party, in 2007. He started internal elections in these organisations to ensure that workers had a say in the election of office-bearers. That process, however, lost its zing soon as veteran leaders started using money and clout to manipulate the election process to get their children elected. The latest experiment has come in the form of a digital platform, Shakti, that connects Congress workers across the country with the party headquarters, which in turn uses the database to gather feedback. It’s run by the party’s data analytics department, headed by political economist Praveen Chakravarty. The project was launched in July. 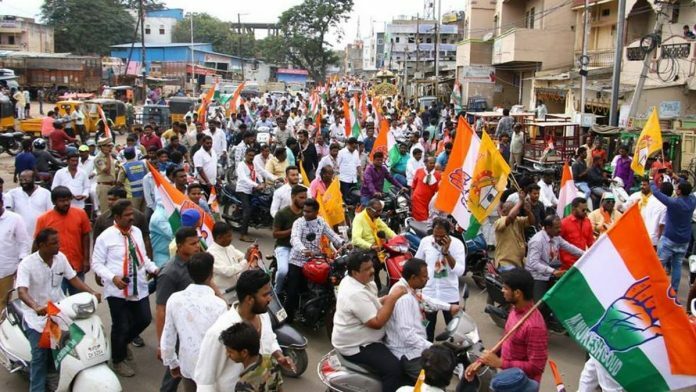 The Congress’ decision to join hands with its rival, the Telugu Desam Party, for Telangana elections on 7 December was also based on the results of a survey of voters and party workers, Chakravarty told ThePrint. Days before the alliance between the TDP and the Congress was sealed, party president Rahul Gandhi asked the data team to give its inputs. Responses were sought from over 1.2 lakh voters and workers of the Congress whether the party should go ahead with the alliance for the assembly elections. “For instance, the majority of the responses were in favour of an alliance in the case of Telangana. This is one of the inputs that was taken into account before the alliance was formalised,” he added. Last week, the Congress, TDP, TJS and the Communist Party of India (CPI) — all of which had formed an alliance in Telangana — had decided to contest 93, 14, 8 and 3 seats, respectively, out of the total of 119 assembly seats, with one seat to be given to a smaller party. “TDP was against the formation of Telangana. So it was important to know whether there would be resentment among workers and voters if an alliance was made,” said another Congress leader associated with the project. “But majority of them responded positively to the proposed alliance,” the leader added. For candidate selection too, the data analytics team gave inputs on the strength and weaknesses of the candidates. More than 6 lakh people across all the four states — Madhya Pradesh, Chhattisgarh, Rajasthan and Mizoram — were asked to give names of candidates they felt should be fielded by the Congress. The entire exercise was completed in October allowing the senior leadership to take the results into account apart from other factors to arrive on a final decision. The exercise doesn’t stop there. After candidate selection, the data team also does handholding of the candidates by giving them information about the areas to focus on for the elections, the issues that are important, giving them details about the influencers. Because of the Shakti project, the central leadership of the Congress is even aware of the concentration of party workers in a particular area. Gandhi is said to contact some of these workers directly ahead of his public rallies. Like the first experiment, the latest one also has got some sceptics in the party. A ticket aspirant can manipulate the results of the internal survey by enrolling his supporters in the Shakti project, who would be asked to name winnable candidates, said a Congress leader. But, if the candidate enjoys the support of so many party workers, so be it, he added.